Will you contribute towards the $9,000 cost of materials for a new floor so we can bring back our community meals? Read below for more info. Around Graffiti, we have learned the value of not just feeding people, but eating with people. Consider all the times Jesus ate with people and their lives were forever changed. Zachaeus, Peter, and the two men on the road to Emmaus are just a few instances. 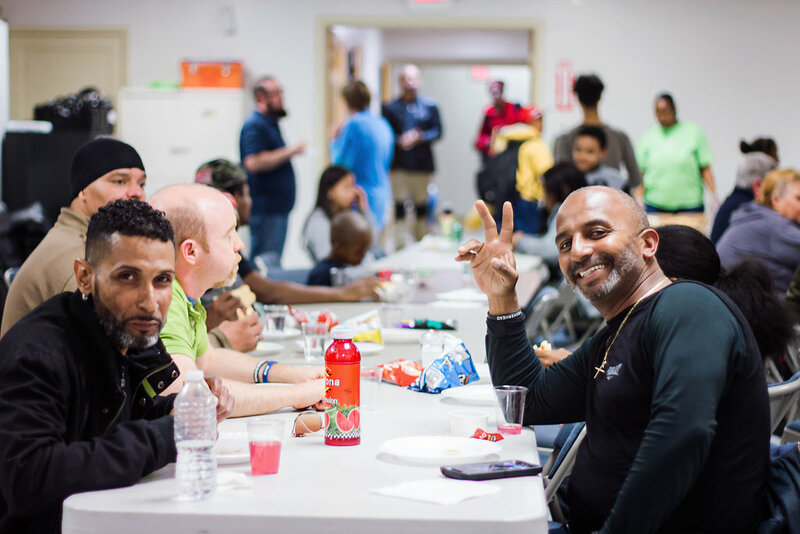 For many years, Graffiti 2 was blessed to serve a weekly community meal to our neighbors. It was a rare instance in our community where people of all ages and backgrounds came together in a space that felt like home. Although our recent move has been a blessing to our ministry and church, the facility did not have a kitchen nor an adequate space to host meals. In the spring, a mission team from Mississippi helped us build a kitchen. Now, we have a team from North Carolina willing to help us install a new vinyl floor. The current floor is carpet and is not suitable for serving food–especially when a lot of messy kids are eating! We are prayerful the work will be completed before Thanksgiving, so we can host a community meal to celebrate the holiday! Will you contribute towards the $9,000 cost of materials for our new floor? Continue to pray for the work on a new bathroom. Funds have been raised and set aside, however, work has been delayed due to structural repairs and bureaucratic hurdles from NYC’s Department of Buildings. Please pray these challenges will be overcome and the bathroom will be complete by Thanksgiving as well.